The Tardis covered in tarpaulin. 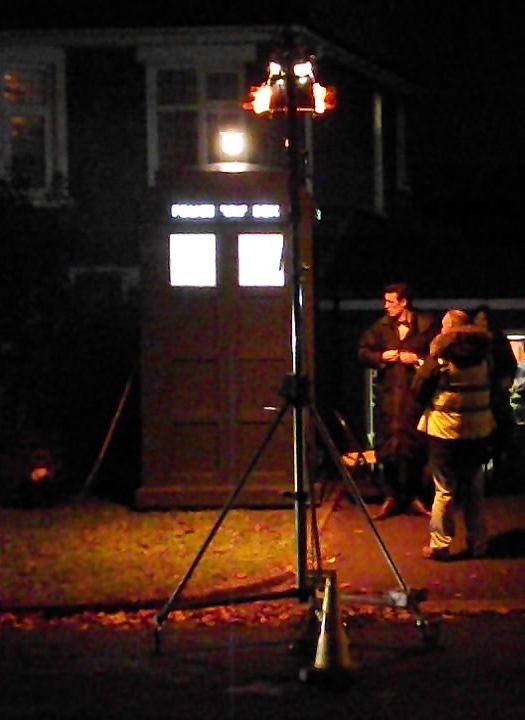 Well it's been a long wait, but finally there was some more filming yesterday. By which I mean - filming where we can see it, have managed to get to it, it isn't raining all over us and dialogue can be heard. So that was awesome. Cardiff's freezing though. 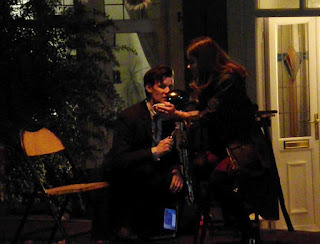 The filming was for episode six - the first episode after the Christmas special introducing Jenna Louise Coleman as Clara, the new companion. 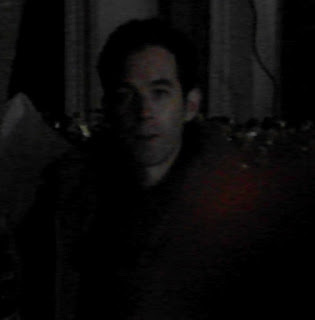 The episode is being directed by Colm McCarthy. 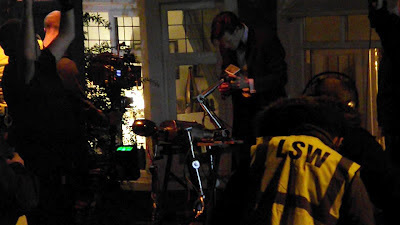 From when we arrived at about 6pm until we left (a little to midnight) they filmed one scene outside a house. One of the crew told us it was four and a half pages long - hence the amount of time it was taking to shoot. 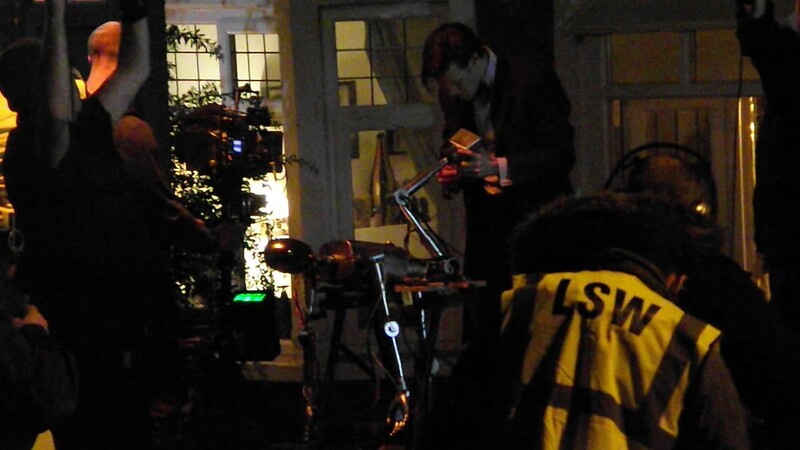 The Doctor examines the robot. The scene begins with Clara coming out of her house with a cup of tea and chair, which she sets down next to The Doctor. He is standing over a robot, complete with wires everywhere and trailing limbs. He has various paraphernalia around him - a small netbook, an oil can, a hammer, a spanner - he uses both the hammer and the spanner on the robot. They both sit down and begin to chat. The Doctor shuts the netbook, seeming to have heard or realised something that causes him to look out past the Tardis. He then demands - with urgency - that Clara gets inside "the box" (The Tardis.) They argue a little, with some playful innuendo on Clara's part. The director then calls out "Boom. Boom. Boom. Boom." 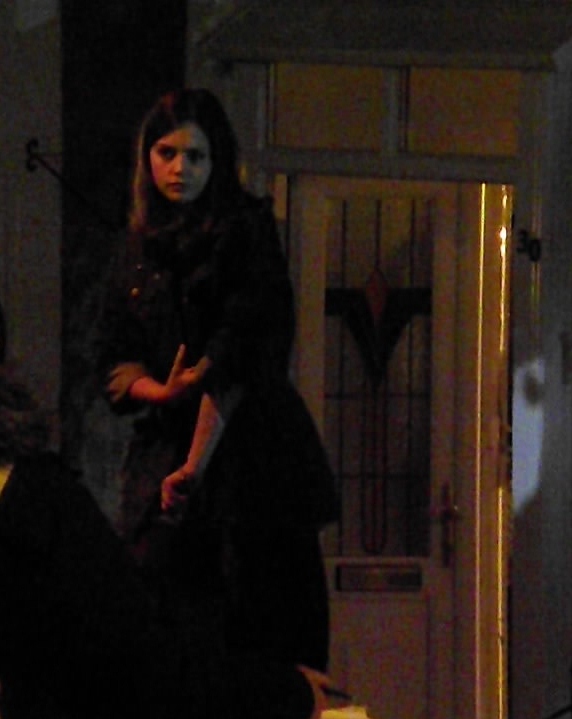 and The Doctor and Clara look around a little each time, finally looking out past the Tardis towards a mysterious dark figure standing under a lamppost. They continue looking around, Clara spotting something by the front door of the house. They rush into the Tardis. They rehearsed this scene for a few hours before going on to shoot it. 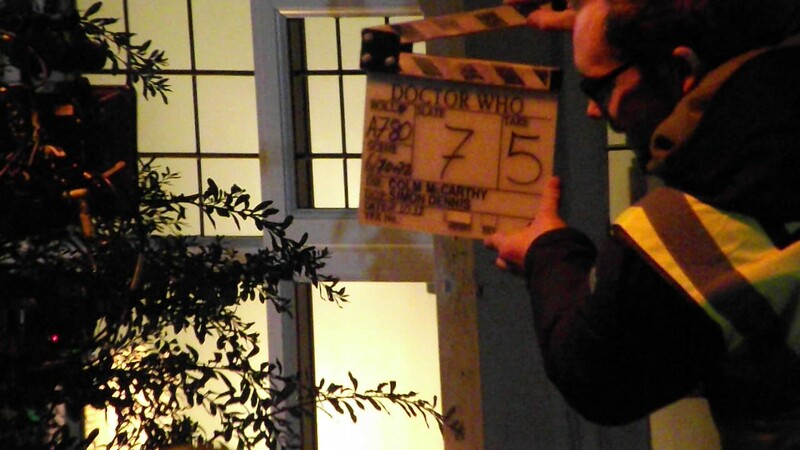 It appears to be a very early scene in episode - the clapperboard read as slate 7, and Clara does not seem to recognise the Tardis or have been inside it before. This seems unusual as no doubt the Tardis would have appeared in The Snowman (The Christmas episode.) The Doctor calls her a governess, and seems to start to say something before stopping himself. @gabundy has posted the audible dialogue for the entire scene on Gallifrey Base. I have quoted him below. Many thanks to @BBC_Fangirl for typing it up! The "script" isn't word-for-word perfect, but you get the idea! Doctor: I like your house! Clara: It's not mine - I just work there. Doctor: Just like I thought you would be ... ! But this isn't exactly a career choice, why here? Clara: Well, my Mum died, I had no ties, no plans, so why not? Doctor: People always have plans. Doctor: It's the internet. Wifi. There's wifi everywhere around us. We are living in a wifi soup. But, imagine. If there was something in it. Something living in the wifi. Harvesting human minds, copying them, editing them. A million souls, trapped like flies in the World Wide Web, all crying out. Doctor: Yes. Sentient Twitter! Hold on... (inaudible) ... And you just made a joke about Twitter?! Clara: Is it the wifi? Is the wifi switching the lights on? Doctor: No, the people are switching on the lights. The wifi is switching on the people! Doctor: You and me - in the box! Now! Doctor: You'll understand once we're inside. Clara: I bet I will! Clara: Why do you have a box anyway? What's in there? Doctor: Clara! ... [whispers] Clara, look... behind you! Doctor: A walking base station. You saw it earlier. 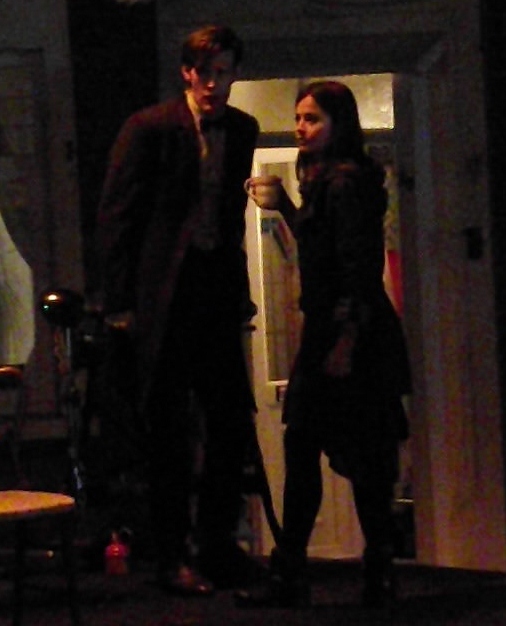 Clara: I saw a little girl. Doctor: Of course! Active camouflage! They drew an image from your subconscious and bounced it right back at you! ... In the box, now! - There appeared to be a photographer taking pictures of them to be used as promo shots. - There was a lovely black cat from the neighbourhood wandering around, occasionally trying to get into shot and distract Matt Smith. 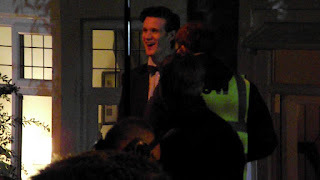 - Matt seemed very cheerful, there were a lot of smiles and laughter. He came over to sign autographs at one point. Fire engine with man stood under the lamppost. 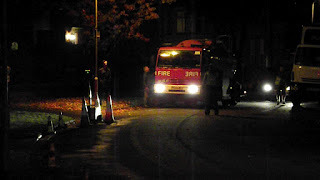 - A fire engine sprayed water on the road at one point - this was probably for continuity purposes so that if it rained they wouldn't have to reshoot everything that had a dry road in it. 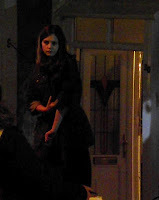 - Jenna was wearing a knee length dark red dress with black tights and black fur-lined ankle boots. She had a dark coat on as well, the same as the one she's worn in the promo images of her. - Matt Smith was wearing a maroon jacket, a white shirt and a bow tie. - The Tardis seemed to be a little thinner and a little lighter blue, but that was possibly just our brains playing tricks on us - we haven't seen it in a while! The extra (?) 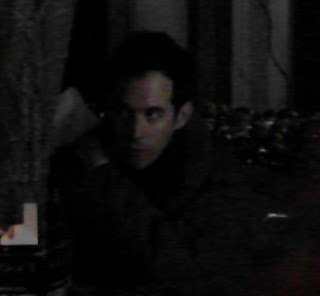 playing the mysterious man stood under the lamppost. Another shot of the extra.